In a remark that provoked an outraged response in the British press, European Council President Donald Tusk lashed out at Brexiteers in Parliament (and all those who supported the 'vote Leave' campaign, saying he wonders what the "special place in hell" looks like for all those "who promoted Brexit" without "even the sketch of a plan" to see it through "safely", according to RT. Tusk uttered the remark during a press conference in Brussels alongside Irish Prime Minister Leo Varadkar, where Tusk reiterated the EU’s position that the Withdrawal Agreement will not be reopened, and said that he hopes Theresa May, who is expected to travel to Brussels later this week, comes with "realistic" expectations. Lamenting the fact that both May and Labour Leader Jeremy Corbyn were "pro-Brexit", Tusk rued the fact that "there is no political force, and no effective leadership" for remain. He also reaffirmed the EU27's commitment to the Irish backstop, saying the bloc wouldn't "gamble with peace." The council president tweeted the remark, and also uttered it during the press conference. As Varadkar anticipated, Tusk's comment has roiled the British press and political establishment. No. 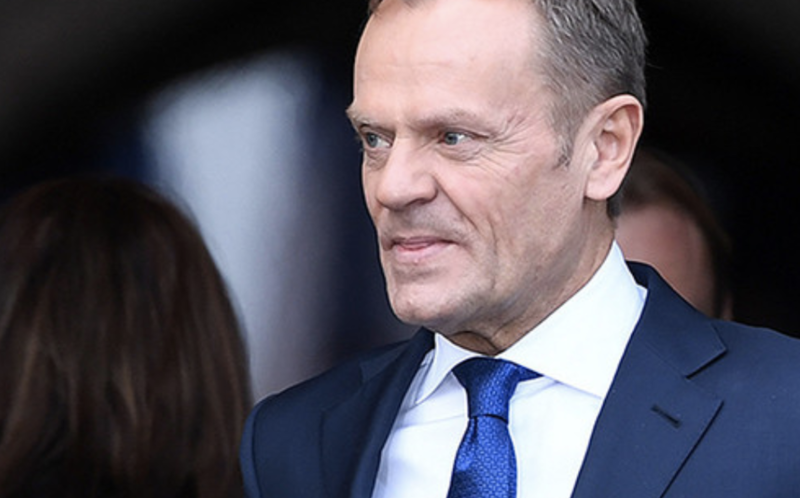 10 Downing Street responded with exasperation to Tusk's comments, declaring that "we can leave the EU in an orderly way, and with a deal that is in the best interests of the UK and the EU." "It’s a question for Donald Tusk as to whether he considers the use of that sort of language to be helpful - and I appreciate that was difficult this morning, because he didn’t take any questions." "We had a robust and lively referendum campaign in this country in what was the largest democratic exercise in our history. People voted to leave the European Union, and what everybody should be focused upon now is delivering the verdict of the British people, so we can leave the EU in an orderly way, and with a deal that is in the best interests of the UK and the EU." Commons leader Andrea Leadsom's response was even more strident: She called Tusk's response "disgraceful" and demanded he apologize for his "spiteful" and "completely unacceptable" remark. And she's not the only one: The Irish Prime Minister Leo Varadkar joked to Tusk that he would have "terrible trouble" with the British press thanks to the remark. And BBC journalist Laura Kuenssberg noted that Tusk didn't exactly evoke "the spirit of compromise"
In what was perhaps the most strident response, members of the DUP derided Tusk as a "devilish euromaniac" (yes, you read that right). And in what was probably the best response to Tusk...one British radio host pointed out that whereever Brexiteers end up, it will probably be nicer than the area of Hell reserved for Brussels bureaucrats. The pound has been sliding on the news, as the odds of May reaching a workable compromise with the EU continue to appear incredibly slim (that is, until the very last minute, when either Parliament, or the EU, can be expected to cave).